As the Christmas fairy-tale is now over all the festive magic has gone back to storage boxes until next December. 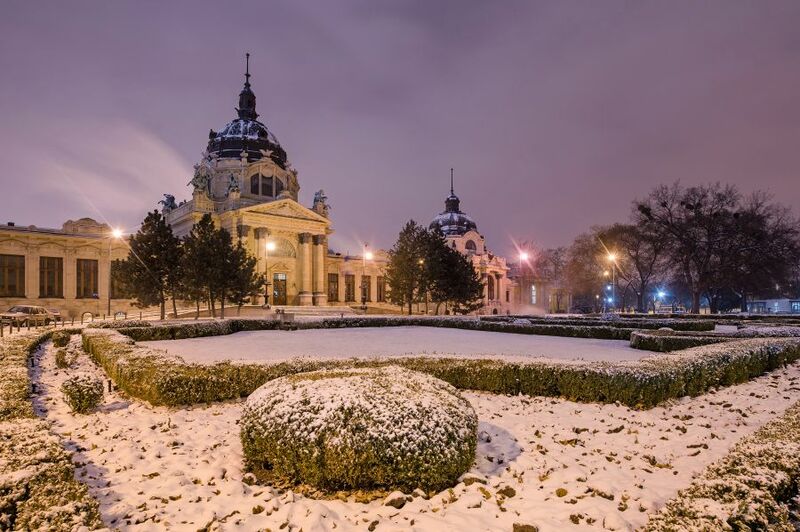 But the Hungarian capital will never slow down: January is an excellent time to visit for real winter lovers, foodies with serious cravings, instagrammers searching for the next big thing and everyone who loves a bit of chill (out). We have numerous reasons that will get you inspired for your stay. 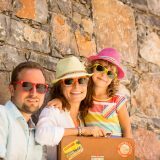 Whether you’re not convinced yet or you’ve already booked your trip, this list will give you all the essentials you need to know before you leave for your adventure. 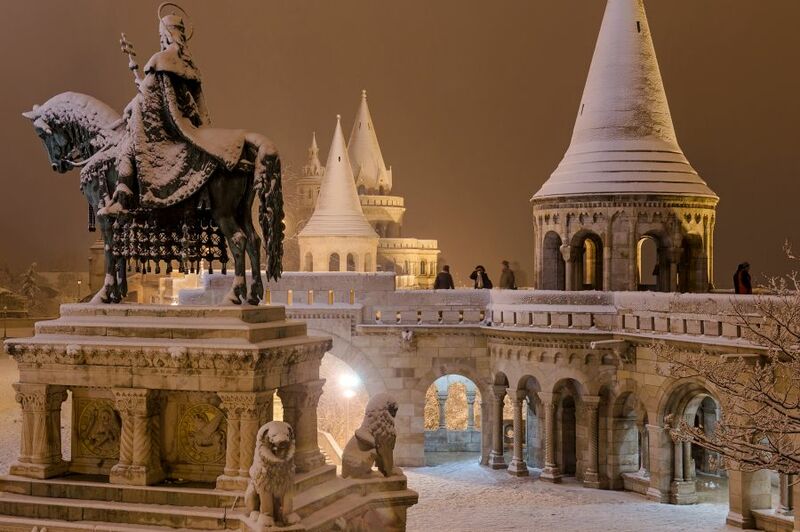 From all the fun winter can offer to cafes, restaurants, museums and spas Budapest has endless reasons for you to stay and never want to leave again. Hungary is geographically blessed with 4 seasons and winter is one of the most wonderful ones. Although January is the coldest month of the year, it is also the snowiest one: snow up to 15 inches on a single day has occurred in the past. The famous city landscape gets a winter wonderland takeover with crisp snow covering the roofs over the city and the thin layers of ice mirroring the bridges on the frozen surface of the Danube. If you thought Charles Bridge in Prague was the real deal, forget it – we guarantee you won’t find a more instagrammable place during January than the Hungarian capital. If you’d like to find the most beautiful places in the city, don’t go any further. We have listed them all for you here. 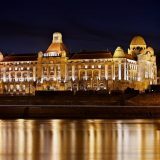 In January people usually hold back their spendings, however Budapest is a great place to save some extra budget for. The Winter Sale is on until the end of January so you are down for a treat with a favourable exchange rate and lots of generous discounts. Budapest has several shopping centres, so you can hide away from the cold and plan a whole day indoors with great shopping, excellent food, cinema or bowling. We have collected all the details about the best shopping centres in Budapest in our previous article about 10 unique reasons to visit Budapest in December. 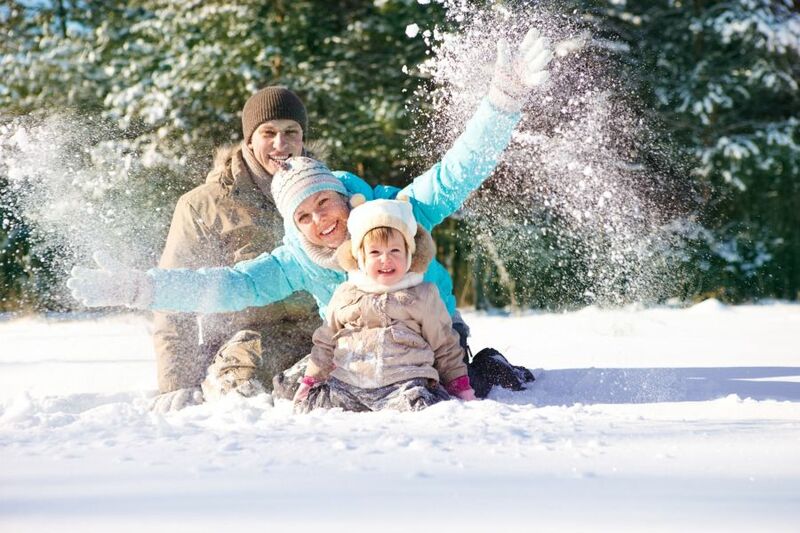 Sledging and good old snowball fights are one of the most entertaining activities with friends or family during the colder winter months. Budapest is blessed with many surrounding hills and green areas that remain untouched when it snows…for a very little while. Those locations will very quickly become the new playground of rosy-cheeked children ever so excitedly pugging their next snow weapon joined in by their parents in an epic snow fight. 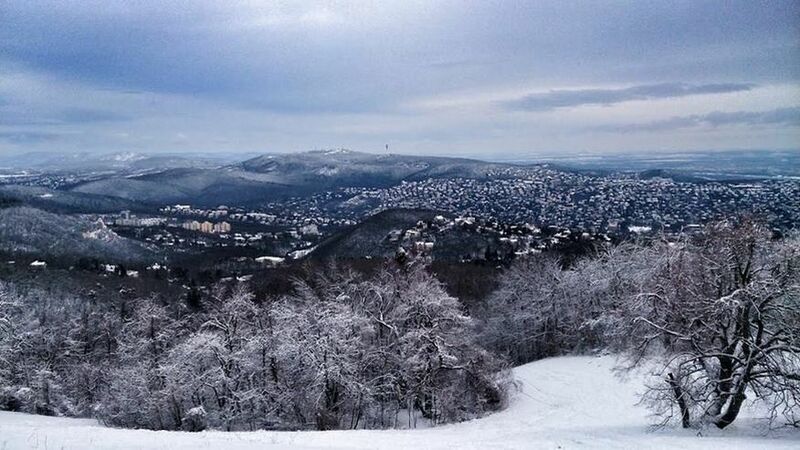 For the best sledging experience head to Buda and explore the gorgeous hilly area of Normafa. The snow is stuck here easier due to higher altitude so the fun is always guaranteed. Normafa being a popular sledging destination, is usually very busy at the weekends. To avoid the crowd choose a weekday for your visit and stop by Anna-ret where the hill provides an excellent sliding experience. Another popular destination chosen by people from the area. With a perfect steepness and a long sledging track it is perfect with little ones as well. Easily accessible by bus this rise in the park is located in the city centre and provides great conditions for an unforgettable experience. We love it because of its many slopes with different steepness and it is suitable for both adults and children. The downside is that parking is free only on Saturdays and Sundays. Until winter lasts Budapest is always a go to destination for ice-skaters. Wherever you stay in the city you’ll find a great ice rink nearby where you can slide, glide or perform your favourite stunts! A great ice rink right by the Palace of Arts on the Pest side where you can do laps while listening to the two channels of Müpa Radio, Easy and Symphony. The onsite bar serves great mulled wine and hot chocolate to warm you up whilst a whole tent of cultural attractions awaits you after your skating session. The rink is open until 27th January. Csepel is a suburban area that is rarely visited by tourists as it’s fairly outside of the city centre (Budapest’s 21st district to be exact which can be accessed by suburban train (HÉV) from Boráros tér). With the coolest ice rink in the city the Csepel Ice Corridor is well worth the travel for a fun winter experience. The rink welcomes all levels, whilst the ice corridor is suitable for racing and showing off your Tonya Harding skills. The onsite wooden huts serve hot drinks and cinnamon-scented nibbles. What a treat! 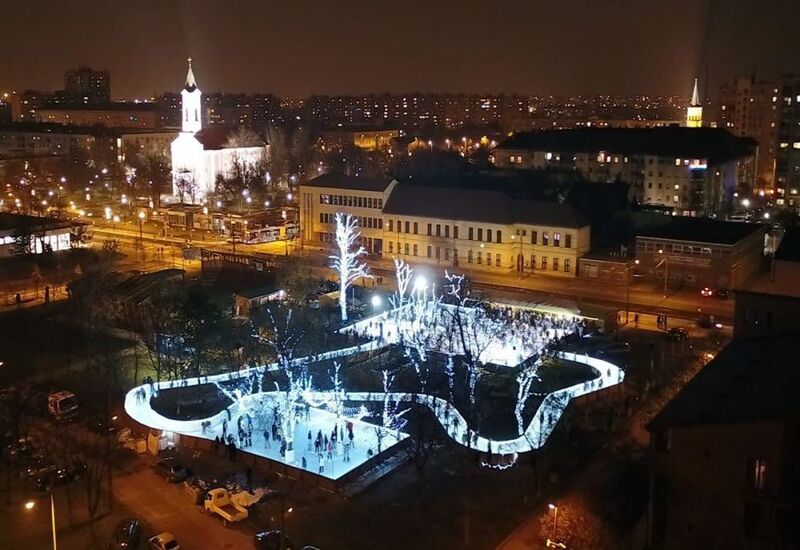 City Park Ice Rink has a unique proposition offering Europe’s largest outdoor ice rink to everyone who’s up for some skating fun. Located in Budapest’s City Park and enhanced by the beauty of Vajdahunyad Castle this place is a real gem. 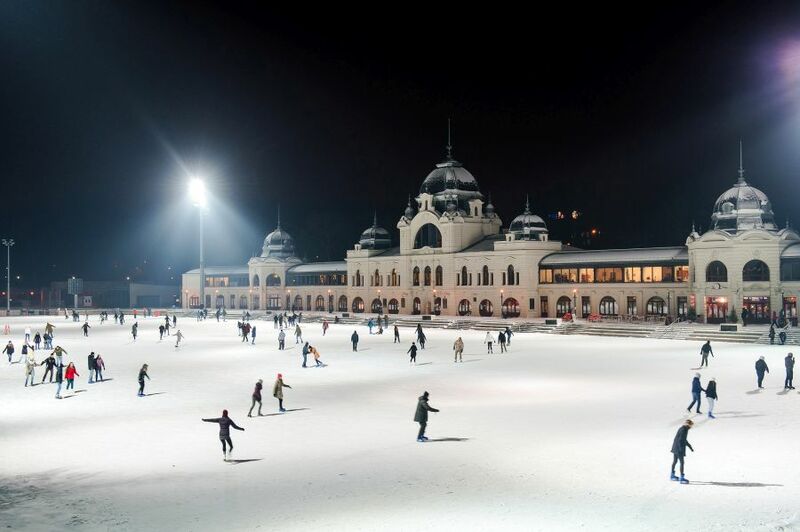 Skate in a historic setting on 15,000 square meters of artificial ice whilst admiring the surrounding historic monuments. You can rent skates on site together with Bobby the Seal to make sliding less of a hard work. The opening hours can vary depending on the weather so always check the opening times here. 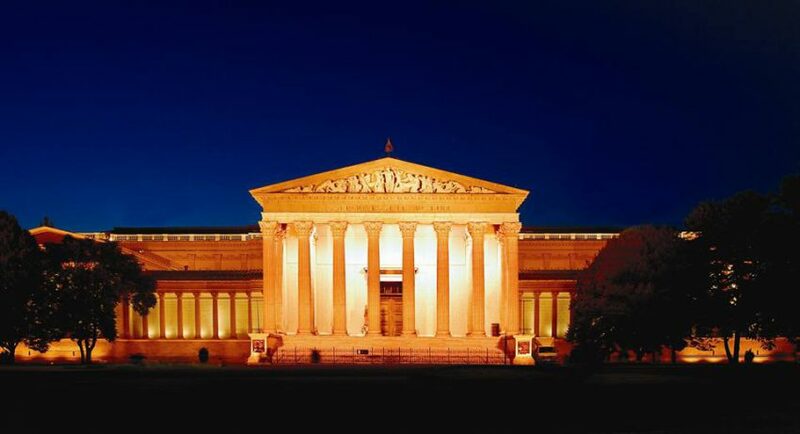 After a long 3-year renovation the stunning Museum of Fine Arts has reopened with a stellar collection on show. New exhibition halls, one of which is dedicated to da Vinci, have been created, the Roman Hall that was closed for 7 years has reopened its doors and Hungarian paintings from the National Gallery arrived to bring real masterpieces into the famous collection. Address: Dózsa György út 41. This permanent exhibition is a unique journey, guided by a blind or partially sighted person, giving an unforgettable insight into their lives. The idea of the Invisible exhibition came from a German man who wanted to experience how his blind wife lives. The tour lasts for 1 hour in total darkness, in 7 different rooms where all you can rely on is your senses: touching, hearing and smelling. The rooms represent our daily life: street, where you have to cross the road; a bar, where you try to pay for a drink or a museum with statues. 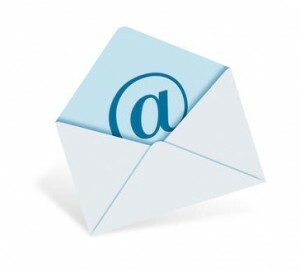 Address: Kis Rókus u. 16-20. In collaboration with Tate Britain, a National Gallery exhibition brings The School of London to Budapest for the first time. 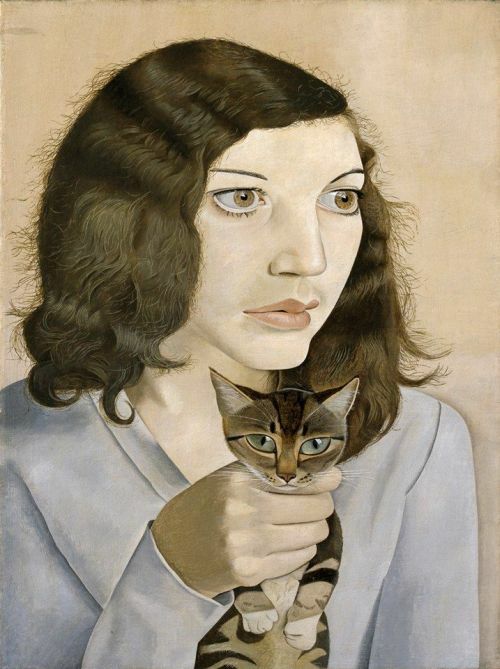 This exhibition works with art from post-war artists from the same social circle who were pursuing different forms of figurative painting as opposed to avant-garde styles. Francis Bacon, Lucian Freud, Frank Auerbach and Leon Kossoff are the highlights. Address: Szent György tér 2. In the newly renovated Museum of Fine Arts Leonardo da Vinci has a special place with the dedicated Michelangelo room on the first floor. The exhibition hall has 10 original Leonardo drawings and the famous bronze statue that was the subject of decade-long debates, but now commonly acknowledged to be a creation of da Vinci himself. Hungary is famous for its thermal water and spa culture that the country inherited from the times it was part of the Turkish (Ottoman) Empire. Thermal water is high in calcium, magnesium, and hydrogen carbonate and is best to ease joint pain and arthritis and improve blood circulation. Housed in a neo-Baroque palace in Budapest’s City Park, Széchenyi Thermal Bath is Europe’s largest thermal bath complex. 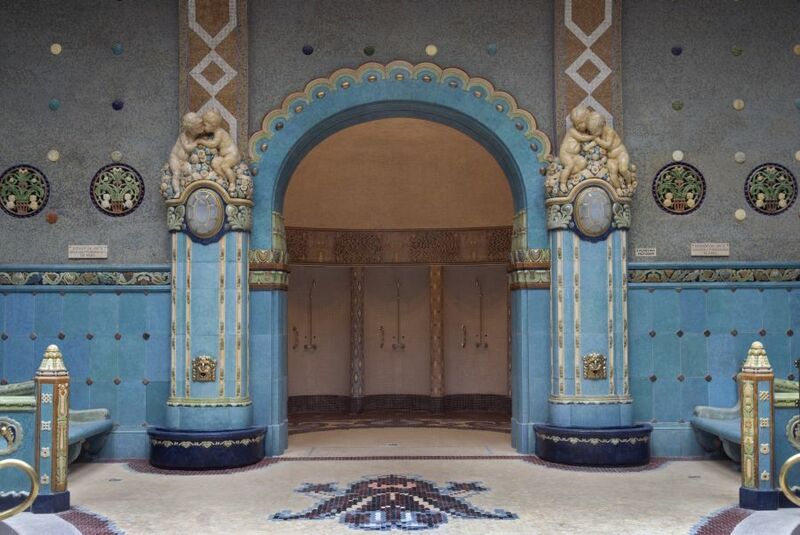 Built in 1913, the spa is home to 15 indoor pools and three huge outdoor pools of different temperatures – which you explore even during the cold winter months. Its water is supplied by two thermal springs with average temperature of 74°C and 77°C. It is open year-round, and you might catch some of the locals play chess on floating boards at the edge of the pool come rain, sunshine or even snow. The baths can be reached by public transport, metro line 1 (yellow line) from Vörösmarty square. (It is also a station of the yellow M1 (Millennium Underground) line of the Budapest Metro) or the trolleybus 72. From downtown, the bath is a few hundred metres beyond Heroes’ Square. Gellert Spa is located in the historic Hotel Gellert where the bath offers a wide range of healing treatments such as gentle and stronger massage, thai massage, sauna, steam rooms, pedicure, and several outdoor and indoor swimming and thermal pools of various sizes, an outdoor wave pool and hot tubs. 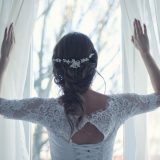 The hotel guests can purchase tickets to the spa for half price. The bath complex was built between 1912 and 1918 in the Art Nouveau style but was damaged during World War II. References to healing waters in this location are found from as early as the 13th century. A hospital was also located on this site during the Middle Ages, then during the reign of the Ottoman Empire baths were also built on this particular site. The “magical healing spring” was used by the Turkish during the 16th and 17th centuries. The bath was called Sárosfürdő (“muddy” bath), because the mineral mud settled at the bottom of pools. Király Bath or Király fürdő was first built in Hungary in the second half of the sixteenth century, during the time of Ottoman rule. It still retains many of the key elements of a Turkish bath, exemplified by its Turkish dome and octagonal pool. Király Thermal Bath had no direct hot water base, nor has it any today. The Turks built the Bath far from the springs to ensure the opportunity for bathing even in the case of an eventual siege, within the walls of the castle. Its water was supplied at that time, and is being supplied now, from the surroundings of the current Lukács Bath. Kiraly Baths have 4 pools on site. You can take a virtual tour of the spa here. 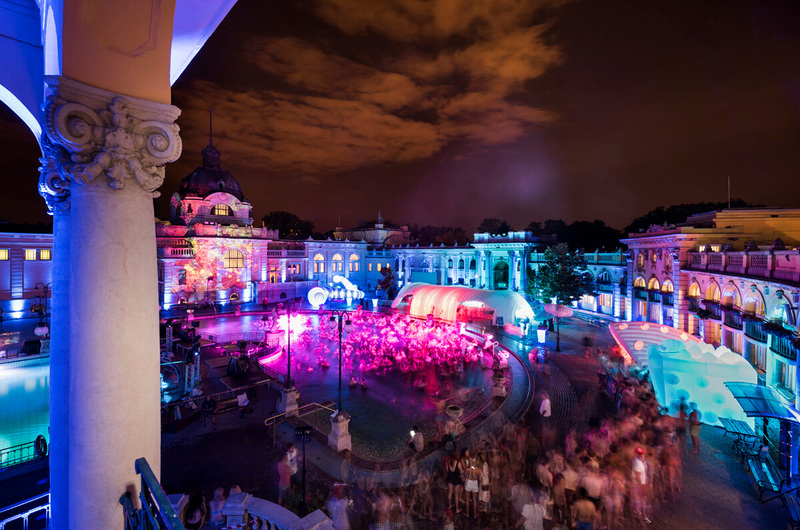 While California dreaming comes with pool parties, Budapest nightlife takes this to another level: taking advantage of its natural features the city turns the thermal baths into the best party venues. 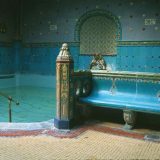 Whilst reforming our thousand years old bathing culture, the aim with the combination of Hungarian bathing and party-culture is to create a unique musical and visual world that cannot be found anywhere else in the world. The good news is that Budapest is slightly warmer than other Eastern European destinations, with an overall average temperature of 30 degrees Fahrenheit (-1 degree Celsius), but it is still frigidly cold throughout January. Please don’t let this scare you away as the city has been designed for the different seasons so you’ll find lots of indoor activities, quality indoor shopping, hot thermal spas, not to mention that queues will be shorter everywhere. 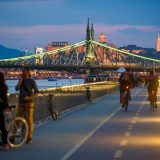 Budapest is an ideal urban destination all year round catering for all weather conditions or any occasions. Winter brings snow and crisp, frosty mornings with a slower pace of life. Visit Budapest in January if you’re ready to get lost in pure beauty, enjoy fun outdoor activities and breathe in real culture.